I’m so excited. I’ve teamed up with 8 fabulous authors in one sensational book bundle. There is something for everyone in it, so don’t miss this terrific opportunity to read some favorite authors and find some new ones. You’ll find my book The Irish Devil in it! 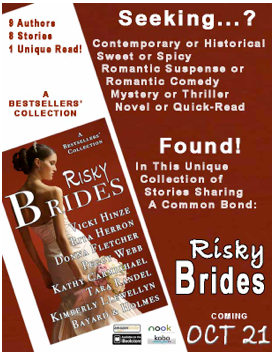 Donna, I’m thrilled that you and and I can finally team up in the collection, Risky Brides. This boxed set different from any I’ve seen because it offers such a variety of stories, historical as well as contemporary, dramatic as well as comedic. It also introduces brand new writers, a big treat for our long-time fans. Fans, we hope you will enjoy reading this collection as much as we have enjoyed putting it together. Thanks, Peggy, it’s a joy to be part of such a great group of authors! The stories in the bundle are fabulous and shouldn’t be missed! There is something in there for everyone! Happy reading all!